Mildred D. McCracken, 90, of Bailey Settlement died peacefully Sunday, Nov. 15, 2015 at her home in the presence of family and friends. She was born the six day of the eighth month of 1925 at Clearfield, the daughter of Francis J. and Junie (Mays) McBride. She dedicated her life to her vast extended family and was deeply loved for her selflessness and generous nature. She had also worked as a seamstress at the former McGregor’s. 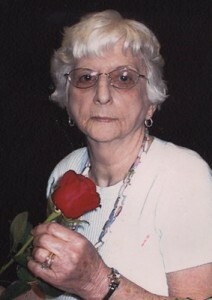 Mrs. McCracken was a member of the Centre Grove United Methodist Church, where she belonged to the Rebecca Circle. She is survived by three generations of grandchildren, Lorrie Harrier Stone and her two daughters, Nichole and Tori Stone, all of Clearfield; Lisa Harrier of Pittsburgh; Scott Abrino of Cranberry; Allison Abrino Dlugos and her children, Aaron, Nathan and Lydia Dlugos, all of Pittsburgh; Riley Bryan of Clearfield; and Jennifer Sorrow of Curwensville. She is also survived by a sister, Mona Lenhart; a brother, Don Ardary; and numerous nieces and nephews. Mrs. McCracken was preceded in death by her parents; her husband, Arnold M. McCracken, who died Dec. 7, 2005 and to whom she was married May 27, 1944; a daughter, Lola M. Harrier; and two brothers, Braden “Archie” and Patrick McBride. Funeral services will be held at 11 a.m. Wednesday at the Bennett & Houser Funeral Home Inc. of Clearfield, with the Rev. Dr. Randy Willis officiating. Burial will be at Centre Cemetery, Hyde. Friends will be received from 2 p.m. – 4 p.m. and from 6 p.m. – 8 p.m. Tuesday and from 10 a.m. – 11 a.m. Wednesday at the funeral home. The family suggests that memorial contributions be made to the Clearfield County SPCA, 275 21st St., Clearfield, PA 16830.